Harley Williams heads home the third goal for Peterborough Northern Star against Blackstones. Photo: Tim Gates. Yaxley pulled off the performance of the second qualifying round in the FA Vase today (September 24). The Cuckoos were twice behind against Eastern Counties Premier Division high-fliers Newmarket at In2itive Park, including once in extra-time, before blasting their way into Monday’s (September 26) first round proper draw with goals from dynamic duo Dan Cotton and Phil Stebbing. Jake Sansby in FA Vase action for Peterborough Northern Star against Blackstones. Photo: Tim Gates. It was 4-3 Yaxley after 120 minutes, a fine effort as they had been reduced to 10 men by a 58th-minute red card for Ross Watson. Cotton scored twice in the match with centre-back Stuart Wall claiming the other Yaxley goal. Yaxley, who signed defender Jake Pell fromn Whittlesey Athletic this week, are joined in the first round hat by Peterborough Sports and Peterborough Northern Star. Sports won the day’s most eagerly-anticipated tie as the leaders of the United Counties Premier Division and the Eastern Counties Premier Division clashed in Mildenhall. It was predictably competitive and Sports, who fancy their chances of a strong run in the competition, had to come from behind to win 3-1 with goals from Jordan Macleod, Josh Moreman and recent signing Stuart Eason. Laureano Da Silva on the ball for Peterborough Northern Star against Blackstones. Photo: Tim Gates. Star’s win was rather more routine as they saw off UCL Division One strugglers Blackstones at Chestnut Avenue by a 4-0 margin. Conor Murphy scored twice from the penalty spot for Star with Harley Williams and Dan Wilson also on target. Star ‘keeper Dan George also made a brilliant save from a Stones’ penalty kick midway through the second-half. But Huntingdon Town and March Town United are out of the competition after defeats at the hands of Swaffham and Gorleston respectively. March were always chasing their game, but they battled to the final whistle before succumbing 3-2. Lewis Thompson and David Jackson scored their goals. Peterborough Sports’ day was made even better by a 1-1 UCL Premier Division draw between title tivals Newport Pagnell and Holbeach United. Sports hold a three-point lead at the top. Tyler Wright’s first-half goal looked like giving unbeaten Holbeach a valuable win, but the home side’s pressure meant they deserved their 82nd minute leveller from a corner. Josh Ford of Holbeach was sent off in the final stages. Deeping Rangers showed great patience to beat Leicester Nirvana 3-0. 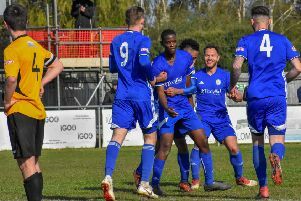 The visitors to Outgang Road played an hiour with 10 men, but Deeping scored all their goals through Scott Mooney, Dan Schiavi and William Bird in the final 10 minutes. In Division One Bourne went down 3-1 at Potton. Craig Rook scored a consolation goal. Spalding United are still top of Division One South of the Evo Stik Northern Premier Division despite throwing away a 2-0 lead at home to Gresley. Nathan Whitehead scored after three minutes for the Tulips and when prolific marksman Brad Wells made it 2-0 on the hour mark the points looked safe, but Gresley fought back and finally equalised with an 88th minute goal. There was even later disappointment for Stamford AFC who took the lead in the 81st minute at Sheffield FC through Oliver Brown-Hill, only for the home side to equalise from the penalty spot in the 90th minute. Spalding Utd 2 (Wells, Whitehead) Gresley 2. Gorleston 3, March Town United 2 (Thompson, Jackson). Deeping Rangers 3 (Schiavi, Mooney, Bird), Leicester Nirvana 0. Newport Pagnell Town 1, Holbeach United 1 (Wright). Potton United 3, Bourne Town 1 (Rook). Stowmarket Town 6, Wisbech SM 1.